April Etmanski is a filmmaker who lives in Toronto. April grew up in Oshawa and studied theatre and music in the O’Neill C.V.I. Performing Arts program. After receiving a B.A. in Film Studies from Carleton University, April moved to Toronto and pursued a career in film. 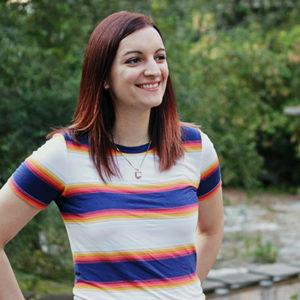 A graduate of Humber College’s Post-production program, April has been working in the industry for over seven years in post-production as an editor and colourist. April appeared as the lead actor in the short film “We’re In A Fight” (2014) and in “Impossible Horror” as Amber. April has also performed in podcast productions including several episodes of the live radio play “VRMP Radio Presents: The Five People You Meet In Hell” (2016-2017). She is currently expanding into writing and producing, rounding out her expertise in filmmaking.